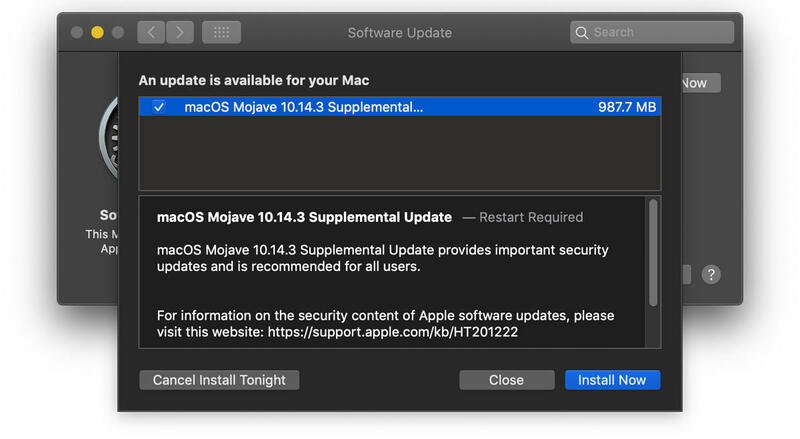 Apple on Thursday updated macOS Mojave with the release of the macOS 10.14.3 Supplemental Update. The update was released in conjunction with the iOS 12.1.4 update. The Supplemental Update fixes the Group FaceTime bug that has been making headlines lately. While most people associate the bug with the iPhone, Group FaceTime support is available on macOS Mojave. The update also fixes a security problem involving Live Photos in FaceTime. The security notes for the Supplemental Update are available online. Before installing any system update, perform a backup of your data. Here are the steps for the installation. 1. In the Finder, click on the Apple menu and look for an update indication for System Preferences, as shown in the image below. If you see an indication for an update, select System Preferences. 2. You should be at the window for Software Update. Your Mac will check online to see if the update is available. If it is, click on the Update button. 3. A warning will appear, stating that your Mac will need to restart. Click Download & Restart if you can proceed. The download will take a few minutes and your Mac will automatically restart. If your Mac doesn't restart, go back to the Software Update window and click the Update Now button. A Restart button may appear. Click it to proceed.